This HANYUAN production line is mainly used in the grain food production, such as Peanut Candy, Crispy Peanut Candy, Rice Candy, Nutrition Cereal bars, Shaqima, Crisp Nut Cake, Crispy Egg Cake, etc. The HANYUAN new generation machinery is a reasonable structure equipped with frequency controller. It is easy to operation, convenient to maintenance, having good cutting shape, adjustable length, big capacity. It is the best choice for food manufacturers, who product Peanut Candy, Rice Candy, Sesame Candy, Shaqima, Crisp Nut Cake, Crispy Egg Cake. It has multi-compress structure to make uniform thickness. Feeding, paving, compressing, cooling, cutting, a sequence of production action. The cutting size can be adjusted to meet the needs of different specifications. Variable frequency speed to achieve, automatic cutting, time-saving, economical and economical. Our company specializes in the production of Food Making Machine, Frying Machine, Baking Machine,Moulding Machine, Packing Machine, Nutrition Cereal Bars line, Rice and Nuts Bar Moulding Line, Caramel Treats Line, Oatmeal Chocolate Line, and other kinds of food machinery. Our company provides professional food machinery customization service and food production technology consulting service. Our company has passed the ISO9000 quality system certification, and its products have passed the CE certification. Our company is a technology-based industrial manufacturer, integrated with design, production, sales function, its technical force is strong, its product manufacturing experience is abundant, it owns a group of professional research staff. Our company wins the trust and praise of domestic and overseas customers with its highly professional dedication, advanced design philosophy, reliable products quality, perfect after-sales service system. Our company will provide the more practical and more intelligent products for the new and old customers based on the concept of professional design, elaborate manufacturing. Create a better future hand in hand! The cooperative partnership is a high-level cooperative relationship between HANYUAN MACHINERY and Food Enterprises. Based on mutual trust, the two sides are mutually beneficial and long-term cooperation. HANYUAN MACHINERY is a technology-based industrial manufacturer, integrated with design, production, sales function, its technical force is strong, its product manufacturing experience is abundant, it owns a group of professional research staff. With its strong technical force, rich production experience, professional dedication, advanced design, reliable product quality, perfect after-sale service system, HANYUAN MACHINERY wins the trust and praise from the domestic and foreign customers.Company has built partnership with many food enterprises both at home and abroad: Strongfood, Bami, HuaShengYuan, Hsufuchi, Xiamen Taizu, Huanglaowu, Beijing Daoxiangcun,Nestle, Hongsenlin, Youi, Yake, Jinda, Andersen, Liangfeng, Caizhizhai, Madajie and so on. Our company will provide more practical and intelligent products for the new and old customers with the "Professional Design, Elaborately Manufacturing". Welcome all customers to our company for investigation and consultation, we are looking forward to your arrival. 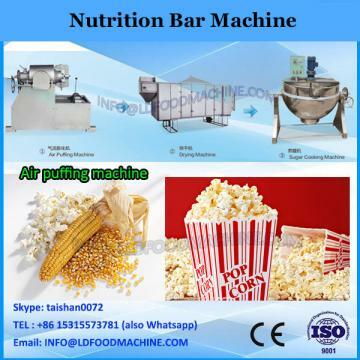 China Nutritional Snack Food Cereal Bar Making Machine is the use of rice flour, flour and other kinds of grain flour as raw materials to add some vitamins, trace elements and other high-nutrition ingredients mixed uniformly after extrusion curing and then for nutrition to strengthen the rice, after drying, shape, appearance taste edible method and natural The rice is consistent and supplements the lack of nutrients in natural rice. can also customize special rice with different functions according to different groups of people. Jinan Joysun Machinery Co., Ltd. has single screw rice extruder and twin screw extruder. can be freely matched according to the requirements! 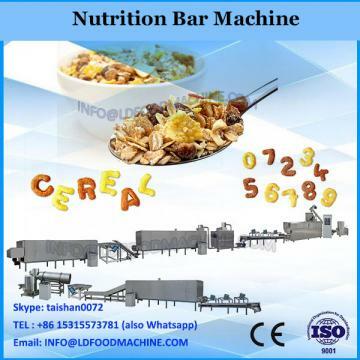 China Nutritional Snack Food Cereal Bar Making Machine technology is a breakthrough in the recycling of grain using the principle of extrusion. The most important feature of technology is the addition of various nutrients essential to the human body to food, producing a variety of health foods, curative foods and functional foods. The products are easy to eat and easy to use. Digestion and absorption, welcomed by consumers. Artificial rice alias nutrition rice, gold rice.